It is as though I am back in my college years, spending my semester abroad. This fall I am living in the beautiful city of Leuven, Belgium, a city of about 100,000 people and located about twenty miles outside of Brussels. 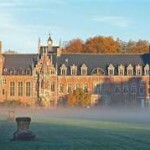 I am teaching at the Catholic University of Leuven Law School’s Criminology Institute where there is a vibrant and well-known restorative justice department. A group of professors here, led by highly respected Dr. Ivo Aertsen, as well as many Ph.D. students and researchers, are examining and writing about the impact of restorative justice programs in many different countries and cultures. The university was founded in 1425, making it the oldest Catholic university in the world. There are 40,000 students here (and I think they all ride bicycles). I also have the privilege of living in what is called the Groot Beginjnof (or for us French speakers “the Grand Beguinage.”) In about 1325, groups of women from the Low Countries decided to create their own religious communities and build small towns in which they lived. They were strong, independent women who did not want to attach themselves to religious orders (and wanted to maintain control over their personal finances rather than give them to the Catholic Church). All the communities of women are gone, as are many of the buildings they lived in. However, some of the beguinages have remained and now have become World Heritage sites. Fifty years ago, the university in Leuven had the foresight to purchase the buildings here and turn them into apartments for visiting international faculty members. I have a lovely studio apartment located amidst what looks like an ancient monastery, with cobblestone streets and a meandering river. In fact this picture is of a house just around the corner from my apartment. Since Leuven is a Flemish-speaking town, I am fortunate that the programs I am working in all are taught in English. Although my Belgian mother was Flemish, I never mastered the language. My French can be quite useful in southern Belgium and Brussels, but people in Flanders refuse to speak it. The development of restorative justice applications in Belgium is amazing. The federal government funds much of this work in a variety of criminal justice settings. Since 1994, federal regulations have governed what is called “penal mediation”, which is facilitated through prosecutors’ offices. Those mediations occur in the midst of the criminal court proceedings and can impact how the prosecutor decides to proceed. To spend a semester as part of a highly respected academic community studying the global impact of restorative justice programs in a myriad of settings has been sheer joy for me. I look forward to returning to Marquette Law School next semester with a newly ignited excitement of our work with the Restorative Justice Initiative and the possibilities for things to come. Sounds like a stimulating environment. I am sure you have a lot to offer! Sounds like a great time in a lovely place! While Leuven has a great history, there were already many Catholic universities thriving all across Europe by 1425, from Oxford and Cambridge in the west to Praha and Krakow in the East. I would love to see the principles of restorative justice applied to corporate crime and malfeasance. Can you imagine Wall Street bankers explaining to their victims why they brought this country to its economic knees? 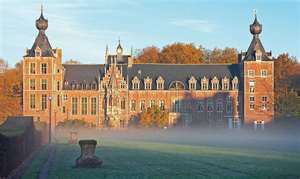 Don Schauer is correct that there were Catholic universities before the University of Leuven but it is generally recognized as the “oldest existing Catholic university in the world.” I appreciate the clarification. Leuven sure is beautiful! I was there for a few months last year and had a chance to visit the Catholic University. Congratulations Janine! Wonderful and inspirational! Sounds like absolutely wonderful and transformational work in Belgium. You’ll bring amazing energy and leadership ideas home with you. Wishing you well in your travels!